because atmospheric &1did not decrease despite the continued increase in fossil fuel combustion (see Francey et al., 19%). After 1990, the NH sink continued to increase to 4 PgC/y in 1993, whereas the SH sink leveled off at 1.5 PgC/y. The NH sink is greater than would have been expected from the SOL This NH sink also cannot be dominated by the land, inasmuch as atmospheric 'C resumed its decline after 1990, Francey et aL (1996) inferred that the global ocean sink dominated after the 1990s. We hypothesize here that the North Atlantic «ill become a significant sink after the 1990s. The hypothesis is suggested by an analysis of the surface marine conditions in the Atlantic It turns out that the decadal North Atlantic oscillation (NAG) index was very positive starting in 1990 (Hurrell, 1995). The NAO index represents the pressure difference between Azores high- and Icelandic low-pressure systems. Positive NAO index is accompanied by strong westerly winds and storminess, which arc conducive to CO? uptake by the ocean. A terrestrial carbon sink is an annual imbalance between uptake and release, each of which is seasonal. Together, they impart a signature in the seasonal oscillations of CO? in the atmosphere. The annual CO? iluxes due to photos} nthetic uptake and decomposition release are largest (M kg/nr/y) in the Tropics and decrease poleward. However, the tropical fluxes are nearly synchronous and cancel, and so they leave little signature in the atmospheric CO2 record. When averaged over the globe, the growing season net flux is ^15%-20% of the annual net primary production. The largest contribution to the growing season net flux, and hence the atmospheric CO? oscillations, is from the high-latitude biosphere, where the growing season is shorter than the decomposition season (Fung et al., 1987; DWrrigo et al., 1987; Randerson et al., 1997). Like the annual atmospheric CO? growth rate, the CO? seasonal cycles have not remained uniform through time. The amplitudes of the oscillations at the Northern Hemisphere observing sites have been increasing (Reeling et al., 1996; Randerson et al., 1997, 1999), suggesting changing dynamics of the terrestrial biosphere. The increasing amplitudes may be signatures of net uptake as w ell as net release, as illustrated below. The seasonal cycle at Mauna Loa captures the dynamics of the Northern Hemisphere biosphere* The annual minima occur at the end of the growing season and result mainly from the net photosynthetic uptake (which is not compensated by decomposition release) integrated over the growing season. Similarly, the annual maxima reflect the release integrated through the rest of the year. The anomalous (departures from 1980 to 1994) mean maxima and minima are show n in Figure 3.5. Photos vnthetic uptake (CO? seasonal minima) was enhanced in 1982 and reduced in 1988, consistent with the variations found in the global and NH sinks (compare Figures 3.1 and 3,4). The photosynthetic increase from 1988 to 1992 matched the sink trend hut is smaller in magnitude, thus supporting the suggestion of the northern oceans as a significant sink for this period. The variations in respiration (CO2 seasonal maxima) also vary in time, so the CO2 amplitude variations at MLO cannot be used as an indicator of net btospheric uptake. 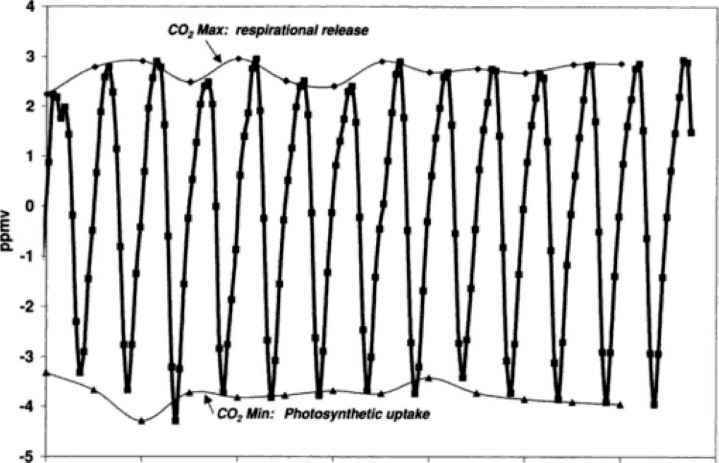 Figure 3.5, Top panel: Dctrcnded CO2 seasonal cycle at Maura Loa, Hawaii (MLO) for 1980-1^94, The variations in rhc minima indicate variations in photosynthetic rates, whereas variations in the maximum indicate variations in respiration rates. Bottom panel: Anomalous concentration maxima,. minima, and peak-trough amplitude of the seasonal cycle at MLQ The anomalies are defined relative to the mean for the period. 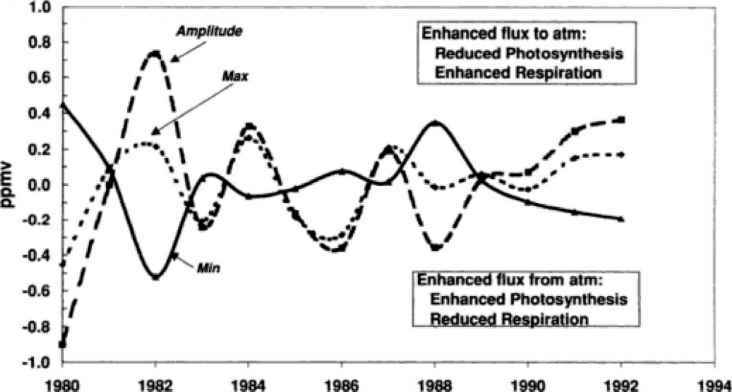 Positive anomalies denote enhanced flux tu the atmosphere. The phasing of the CO? cycles also has not remained constant. Analysis of the monthly growth rate of the seasonal cycle at Point Barrow and other high-latitude sires shows that CO? drawdown has been occurring earlier in the season (Keeling et af, 19%; Randerson et al., 1997). Randerson et aL (1997) show that only early net primary productivity by the high-latitude biosphere can explain the CO2 amplitude increase, net uptake, normalized difference vegetation index (NDVI) trend, and change in the shape of ihe CO? cycle. This argues, at least for the high-latitude sites, that the increasing amplitudes signify net uptake and that climate change is the driving mechanism. The rates of photosynthesis and decomposition are sensitiv e to climatic perturbations. Dai and Fung (1993) suggested that climate-induced interdecadal variations in the terrestrial net flux may be half as much as that of the anthropogenic sink. This large natural fluctuation presents a challenge to the unambiguous identification and detection of the anthropogenic carbon sink, especially in records with durations shorter than the climatic fluctuations. CO* exchange processes at high latitudes are limited by temperature and are hence very sensitive to temperature perturbations. Temperature, however, affects not only photosynthesis and decomposition but also thaw and the subsequent alteration of the water budget and mobilization of nutrients. A positive trend in photosynthesis at high latitudes has been reported in the > 15-year record of the NDYI, the satellite index of photosynthetic activity (Mvneni et al. 1997). The magnitude of the trend is uncertain because of inadequate calibration and atmospheric correction for the multisatellite, multisensor record (Fung, 1997); nevertheless, the sign of the trend appears robust. Like Keeling et al. (1996), Mvneni et al. also infer an earlier growing season from the satellite data. This is consistent with thermometer records of surface air temperature, which show the greatest warming rate in the springtime at high latitudes.